Addressing professional practice gaps with innovative CME programming is a highly effective way engaging members over time. Building interest in CME offerings, however, can be a challenge. In this post, we’ll look at ways to convert association members into motivated and highly engaged learners. Accurately identifying the educational needs of your members and tailoring your programming accordingly is a key ACCME mandate. How well your organization is able to accomplish this task will determine the long-term success of your CME program—and impact your prospects for Recertification with Commendation. But how can you be certain that the method you use for pinpointing your members’ educational requirements is more than guesswork? If you aren’t using a CME platform such as EthosCE—which offers educational needs analysis and instructional design—then you’ll have to manage this on your own. First, start by replenishing your store of member and learner data. As your members needs change, your association’s previous approach to developing curricula may become out of date. That means that in order to remain your members’ go-to CME source, your organization will have to actively solicit learner feedback. This entails more than encouraging association members to respond to questionnaires about their educational needs (although this is an important first step). To develop an accurate portrait of the type of CME programming that your members will respond to, it is critical to complete a thorough audit of course completion rates. The next step is to cross-reference that data with member feedback on the type of CME content and activities that they would enthusiastically receive. Once you’ve gauged members’ interest in existing (or proposed) CME options, use activity completion rates to determine current learners’ commitment to achieving mastery in specific areas. Activities with constantly high completion rates indicate that those topics are relatively evergreen—members recognize their need for coursework in those areas and they will likely want this programming to continue. This knowledge provides you with a pathway towards developing new programs which delve more deeply into subjects of interest which current learners are already highly motivated to explore. If survey responses indicate that a topic that is not covered in your current CME programming is of great interest, then this is an educational need that your program should address right away to keep your members from looking elsewhere. This is an instance in which it is essential to have a flexible, enterprise-grade CME LMS. The ability to easily add a range of new activity content or update your entire curriculum to meet your members’ requirements is essential to maintain and grow your subscriber base. Once you’ve identified what your members want to learn, you’ll have to convince them that your association can provide the programming that they need in the way that they want. For many learners, a frictionless educational experience is just as important as high-quality content. Registration, payment, and platform navigation issues (like user difficulty in returning to activities after accidentally logging out) can compromise the value of the CME program in members’ eyes. Your ability to illustrate the ease-of-use of your LMS platform will determine your ability to attract non-subscribers. Naturally, if your LMS isn’t actually very user-friendly, then you will need to implement a solution that can deliver on your promise well before you begin to promote your programming. One simple option is to use a CME platform which provides an agile, purpose-built LMS and automates the most-time consuming management tasks for you. CME courses are designed to address their unique educational needs. Assure members that their input on how to best address professional knowledge gaps are taken into account as the curriculum is developed, both in format and in content. A superior user experience is a top priority. From registration to printing their certificates, make it known that your platform offers a seamless learner experience and ready customer support. Course content is in line with ACCME and AMA PRA Category 1 Credit™ standards. They might not be aware of the alignment of AMA core requirements and ACCME accreditation requirements so be certain to make this clear. As new members join your courses, you’ll face another challenge: keeping them engaged. As the CME industry becomes more crowded, the battle for the medical professionals’ attention becomes more intense. Winning and keeping learners as subscribers means giving them reasons to feel inspired, not merely engaged. Use content creatively to tell the story of your CME mission. While you probably had plenty of practice with this in developing the Self Study Report, it is important to translate that message into content which resonates with your association’s membership. Blog posts, podcasts, and ebooks can help illustrate the association’s commitment to enhancing members’ core competencies. This type of “open” learning wins the trust of learners, inspiring them to explore accredited courses to take their learning experiences further. Spark conversations about CME. Use special events—on-site or virtual—to launch an open dialogue around CME with members. A coffee and conversation hour or a webinar can encourage current learners and potential subscribers to discuss their needs and share stories about their educational and career interests. These types of events will help you understand where your members’ passions and ambitions lie, as well as guide you in developing programming to help them reach their personal goals. Use your LMS to inspire members to seek an educational challenge. If your LMS allows you to easily add quizzes and other content, offer members temporary access to a sample “mini” course. Allow them to assess their knowledge of a trending CME topic and then find answers to the questions that they missed. Providing your learners with a teaser of what your LMS can offer is a simple way to encourage them to try new educational options, even if they’ve already met their CME credit requirements. 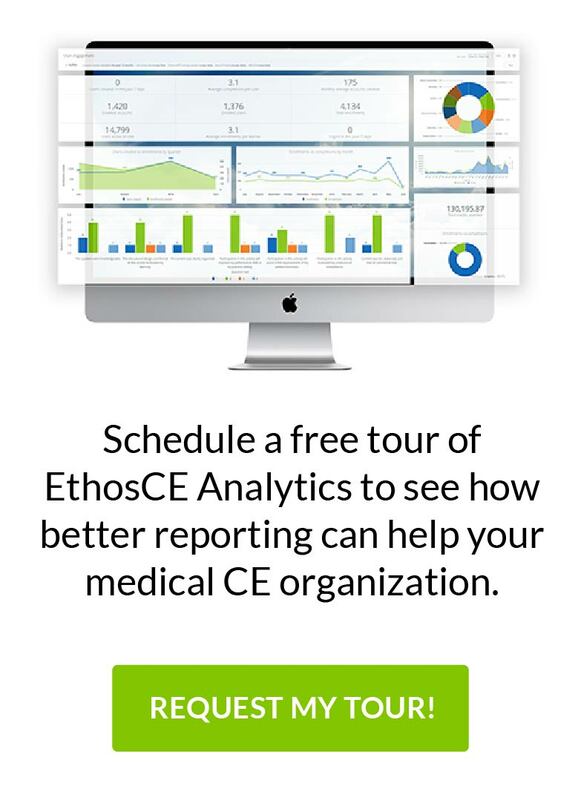 The right CME management platform makes it simple for CE coordinators to consistently deliver the kind of exceptional learning experiences that their association’s members deserve. With EthosCE, you’ll have an LMS that makes creating engaging content effortless. From PARS submissions to curriculum updates to help desk services, our platform makes CME management simple. View our latest features here.